Download a #NotOkay sign here. 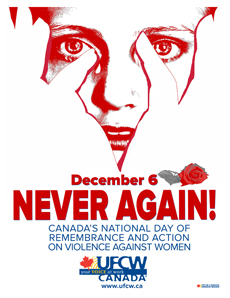 Download the National Day of Remembrance and Action on Violence Against Women poster here. 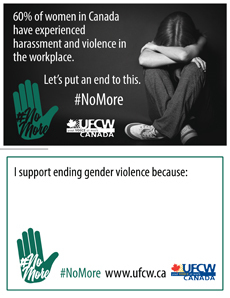 Toronto – November 16, 2018 – UFCW Canada is calling on all activists to take action from November 25 to December 10 to help eliminate gender-based violence. From November 25 – the International Day for the Elimination of Violence Against Women to December 10 – International Human Rights Day, your tweets, Facebook posts, and participation on social media can help spread the word that gender-based violence is #NotOkay – ever! Download and print a #NotOkay sign. Take a selfie with the sign and post it to Twitter, for a Twitter storm at 12 noon EST on November 25 - The International Day for the Elimination of Violence Against Women. 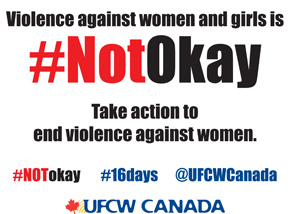 Include @UFCWCanada and the campaign hashtag #NotOkay in your tweets. On Facebook, don’t forget to tag @UFCWCanada in your posts. 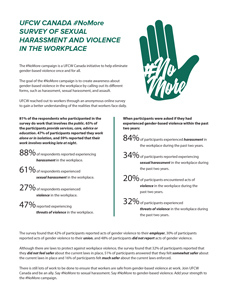 The goal of the #NoMore campaign is to create awareness about gender-based violence in the workplace by calling out its different forms, such as harassment, sexual harassment, and assault. Be an ally. Share your picture holding a #NoMore card that declares your support to end gender violence. Post with the hashtag #NoMore on Twitter, Facebook and Instagram. Share these #NoMore memes and postcards with your friends, allies and social networks. Share the results of a recent UFCW Canada anonymous survey on gender-based violence and sexual harassment. Participate in a commemorative December 6 vigil or Shoe Memorial in your community. 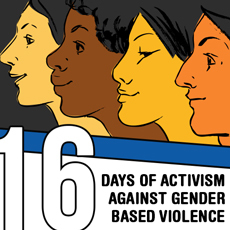 Your activism throughout the 16 days – and all year long – can help eliminate gender-based violence. For more information about the work of UFCW Canada’s Women and Gender Equity Committee, check out www.ufcw.ca/women.